Singapore's neighbourhood of Geylang is strange in that although it looks and feels like a typically 'Asian' neighbourhood, it is actually quite different from the rest of Singapore, which has seen great gentrification and modernisation over the last 40 years or so. The rows of shop-houses bedecked in neon lights, the bustling streets, the curbside food stalls, and masses of karaoke bars present visitors with an urban environment quite distinct from the sleek lines of the concrete-and-glass inner city buildings, while the Geylang Serai market is a prototypical Asian 'wet market', featuring hanging meat and buckets of flapping fish. This grit (and slight seediness) is even more obvious at night, when Geylang's other distinguishing feature becomes most apparent: that it is home to Singapore's only established red-light district. 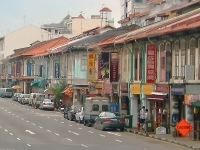 Geylang is a very popular neighbourhood for backpackers (accommodation is usually much cheaper in Geylang than in other areas) and for travellers who find the ultra-modern city centre a bit alienating, and who are craving a more authentic experience of Asian city life. It is also a good place to go to if you're looking for a party, because although Singapore's nightlife mostly consists of expensive drinks in glamorous bars, Geylang is a riot of alcohol and fun and a good time can be had very cheaply in comparison to the rest of the city. To experience a side of Singapore which is not air-conditioned and shining with cleanliness head for Geylang.